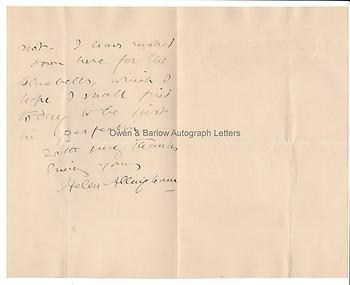 HELEN ALLINGHAM Autograph Letter Signed. English painter in watercolours and illustrator. ALS. 2pp. Betsome Hill Farm, Westerham, Kent. May 15th , no year. 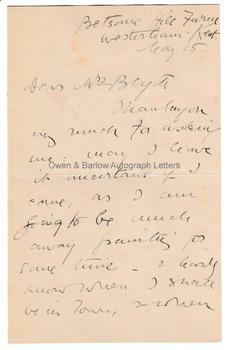 To "Dear Mrs Blythe". 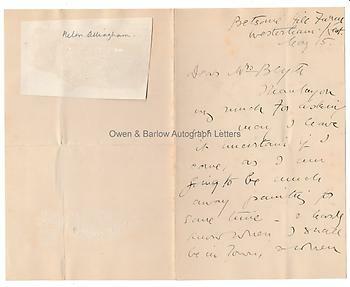 "Thank you very much for asking me: may I leave it uncertain if I come, as I am going to be much away painting for some time. I hardly know when I shall be in town and when not. I was rushed down here for the bluebells, which I hope I shall find today to be just in perfection. With my thanks, sincerely yours, Helen Allingham." 8vo bifolium. 18 x 11.5 cms (7 x 4.5 inches). Small piece of thin card adhering to verso of blank leaf, else fine. Helen Allingham was noted for her watercolours of the rural idyll and made several studies of bluebells in Kent. She was the first woman admitted as a fellow of the Royal Watercolour Society in 1890.